A friend of mine asked me to come watch her daughter’s high school basketball game. The coach was screaming and yelling and pointing, the girls looked confused and then Wham my friend’s daughter threw up a basketball for a basket and the basketball didn’t even touch the net. I turned to my friend and asked, “Why do these girls shoot basketballs off their chests or face and not off the top of their heads like boys do?” She shrugged, and kept cheering. I refused, “So you think it is ok to teach girls incorrectly how to play sports and let them play badly, not knowing why, just because they are girls? And do you think I have good shoulders because I sat on the couch? No, good shoulders can come from weight work and proper technique in sports.” I know my tone was complete disgust. I watched the rest of the game quietly. 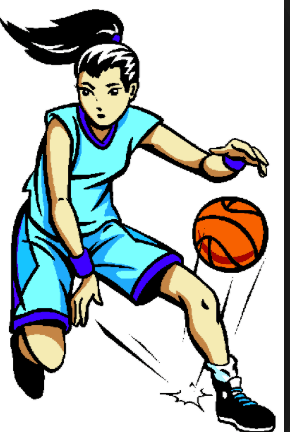 I watched young girls who had never been taught to run, balance, shoot basketballs, stretch properly, all of it. I contemplated on why girls play softball and not baseball, why they aren’t taught to run properly (remember that, ‘oh you run like a girl’ that would be a put down to boys?) Why aren’t girls taught to shoot a basket or throw a football. And the girls who are taught how to play sports properly are criticized as dikes, jocks, etc. and made fun of in school. Ok, I didn’t just watch the game quietly, I simmered. At the end of the game, we walked down to greet my friend’s daughter. She hugged her mom and apologized for not playing better. I lost it. “Are you kidding me? You were amazing to get out there and play in front of all these people. Don’t ever apologize for not being better. Did you do your best, did you have fun, do you want to improve? Well if so, that is the glory of playing a sport and using your body.” She hugged me. But I was still simmering. I turned to the coach as he was picking up his papers off the bench. I made sure no one was within ear shot before I spoke to him. He looked around, waved goodbye to some parents, leaned into me so no one else could hear and said, “These girls aren’t athletic and don’t care so I don’t waste my time.” He walked off. I didn’t respond. I wasn’t born athletic. I choose to be. Girls can choose to be anything they want and we need to give them the proper tools. Parents, please even if you don’t know anything about the sport your child has chosen to play, make sure they have proper instruction so they can play and develop their bodies in the proper way for their health and safety, not just to play a game. There are absolutely no reasons girls can’t be as athletic as boys. NONE.